Whilst I’ve dabbled with modern composition for years, with Feldman in particular being a long term passion, its only really over the last eighteen months that I have really begun to delve into comtemporary composition with real verve. 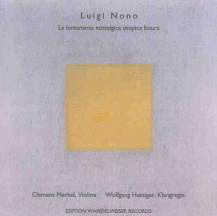 The work of Italian composer Luigi Nono has been amongst the music that has really captured my attention, and the later works of his life in particular. The first Nono I picked up was La lontananza nostalgica utopica futura, the version on the Wandelweiser label to be precise. I have to admit it was probably more the Wandelweiser connection that caused me to buy that version of La lontananza than any great knowledge of the composer or the work, but I’m glad I did. Composed for solo violin and taped violin in 1989, I fell in love with the piece, fortunate to chance upon one of Nono’s last works with this first purchase. (or was it fortune? Having spoken elsewhere recently about the merits of trusting labels you like the output of to introduce you to new work, this is one good example of just that) The Wandelweiser recording by Clemens Merkel remains a real favourite of mine, but subsequent investigations into Nono caused me to pick up a further four versions, with the recording by Gidon Kremer (for whom the piece was originally composed) on Deutsche Grammaphon becoming very hard to shift from my CD player. Each of the versions of La lontananza is quite different as the piece allows a degree of interpretation, the Merkel version lasting a full twenty minutes longer than the Kremer, but the music is naked, open to the elements stuff, conversations between one man, his instrument and the taped material. Sustained notes, small fagments of cut up violin figures, dry lines weaved between each other, wonderful stuff. Over the last year I’ve extended the number of Nono titles on my shelves to fifteen or so, initially just buying whatever I saw, but after a while realising the later compositions, mainly from the eighties were the ones I was enjoying the most. Fragmente – stille an Diotima (Framents, silence for Diotima) recorded by the Arditti String Quartet for the Montaigne label is another real favourite. Delicate, gentle sections that demand the attention of the listener sit amongst a quiet background. The music has an almost ethereal feel, a lightness in sound yet a depth of feeling beneath it that bubbles to the surface every so often in short dramatic flourishes. I think Fragmente is Nono’s only string quartet, though I may be wrong. On the same Arditti disc there is a version of Hay que caminar for two violins composed in 1989, another great piece written around the same time as La lontananza (a version actually appears on the Kremer DG release). This time no taped violin is present, the score is for two humanly manhandled violins. However the learnings of La lontananza seem to definitely inform Hay que caminar a great deal, with the piece playing with notions of space between the two instruments, their individual sounds carefully pitched in conversation with each other, ideas that developed from Nono’s work with tape around this time. 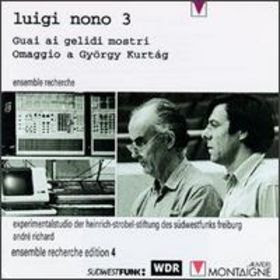 Another very strong release of later works comes again from Montaigne, and the Ensemble Recherche recording of Guai Ai Gelidi Mostri for three strings, clarinet, tuba and two contralto singers, but all treated in real time electronically. The treatments are very subtle indeed, just adding gentle textures to the music here and there, but also extending some sounds out beyond their natural completion, often sitting behind the music to provide a canvas for the splashes of sound. Guai Ai Gelidi Mostri is a wonderfully crafted work, with a supreme sense of balance running throughout, between the instruments and the voices, sounds and the silence and the acoustic and the electronic. 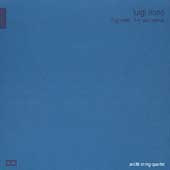 At present I only have a CDR burn of this recording (many thanks to Mr Adam Sonderberg!) but as I type, I think I may have tracked a rare original copy down that should be on its way to me soon. Nono was exceptional amongst the composers that emerged from the 1950’s Darmstadt school in that he was politically engaged. His earlier works wore their social concerns on their sleeve, with the human voice taking a central role in many of the compositions, often a voice of protest against injustices seen first and second hand by the composer. Whilst his later compositions paid more attention to the purity of sounds and their construction into musical works, his music remained inspired by emotional struggles and the need to express something more than mere musical theory. Released just this year as part of Edition RZ’s Jahre Inventionen series, Quando stanno morendo (diario polacco No.2) (Whilst they are dying, Polish diary No.2) was composed in 1981 as a direct response to the oppressive state of affairs in Poland that had brought about martial law and had pulled the country apart. The work is a powerfully emotional composition for four soprano voices, bass flute and cello, with the vast majority of the music focussed on the massed sopranos, their words floating over each other in and out of polyphony. Gradually however the instrumentation breaks in, with the cello in particular treated electronically in a live mix to the degree it is barely recognisable, twisting into ugly churning forms that rise in intensity, giving the music a violence that grips the listener. Spoken word passages also take place in the music at these times when the tension begins to rise. The texts spoken are in a foreign tongue and tell of great peril and horror (“When they are dying, people sing…”). The precise meaning of the words would be lost on me without having read the liner notes, but the desperate, deeply unsettling nature of the words is clear nonetheless. In this form, and through their careful placement amongst the music its as if Nono used the spoken words to blend raw human emotions into the aggressive ravages of the music as if just another instrument. I found Quando stanno morendo a wonderful piece of music, realised here by a long list of names that includes Frances-Marie Uitti’s cello for the RZ release. I have since noticed an older version of the piece on the Col Legno label that I hope to acquire soon, but in the single week that I have owned this RZ version I have been very much taken by this work. There are many more Nono pieces that I have yet to hear, some that I am likely to enjoy as much, some less so, but I make no claims to being an expert in this area. Discovering the joys to be had in Nono’s work along with the music of many of the other contemporary composers I have been listening to has been a real inspiration for me over recent months. I feel like a kid that just stumbled into a new toyshop. My interest in improvised musics has not waned, more CDs appear here than ever before, and you’re unlikely to find a Nono composition appear on Cathnor, but this extra dimension to my recent listening has been a pleasure to discover and share with you here. Recommendations for further Nono (or related) listening would be much appreciated! Oh, and apologies to any readers outside of Europe that may not understand the title of this post! heh, that is pretty much always what I think when I see the name Nono, in all seriousness, good call. since Richard and Robert K.’s opinions diverged so widely on the new Edition RZ disc, I checked it out today to see where my opinion fell. I think I’m closer to Robert with this one, not something I see myself putting on again. oh, and the blog looks great! very elegant, kudos. As for the Nono, that’s cool, each to their own. I’m intrigued about what you didn’t like about it though. Robert (elsewhere) didn’t like the overuse of vocal technique and found the spoken word parts cheesy, were these your issues too? I’ve played the piece a few more times over the last few days and I’d still place it as one of the most impressive pieces of music I’ve heard so far this year. P.S. if there are Blogger police out there that monitor these things, iI was really nice about your software! Do I get something free now?! Thanks for the comment on my blog, Richard. Yes I’m looking forward to hearing some of the new Malfatti CDs when I can afford them – I was thinking maybe Rain Tree Soft Listens , 3 Backgrounds and Nonostante III – does that sound a reasonable choice? Looking forward to properly reading this Nono post of yours as well. I don’t know his music at all – I just found an old LP of his with ‘Como una ola de fuerza y luz’ and ‘Y entonces comprendio’ on it. Not entirely sure what I think of it overall yet, but there are some fantastic passages. Those three Malfattis are a pretty good pick to me, although perhaps only Nonstante III portrays Radu’s recent ultra-minimal style fully. Nonstante III is probably the best disc in that vein though so yes a good choice. I’m not familiar with the Nono you mention, what year is that from?